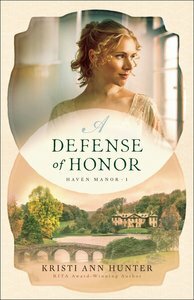 About "A Defense of Honor (#01 in Haven Manor Series)"
Kristi Ann Hunter graduated from Georgia Tech with a degree in Computer Science but always knew she wanted to write. Kristi is an RWA Golden Heart contest winner, an ACFW Genesis contest winner, and a Georgia Romance Writers Maggie Award for Excellence winner. She is a founding member and the coordinator of the Regency Reflections blog and lives with her husband and three children in Georgia. Find her online at www.kristiannhunter.com. Customer Reviews For "A Defense of Honor (#01 in Haven Manor Series)"
What a great start to a new series! Loved this book, especially Graham (the hero), who just can't seem to keep himself away from the secrets Kit (the heroine) tries to hide, continually accidentally finding himself right where she doesn't want him. Hilarious as the situations they find themselves in are, and the group of innocently engaging kids who encourage him, there are so many deeper themes woven throughout the book - grace, forgiveness, faith versus works, trusting God when it hurts. A beautiful story with great characters you'll totally fall in love with. Can't wait for the next story in the series! As first meetings go, Kit and Graham's first meeting is definitely memorable. So is their second. But it's when they meet in Marlborough that things get interesting. Graham is trying to locate his best friend's missing sister, and he realises Kit must know where she is. But Kit has spent the last twelve years protecting women and hiding their illegitimate children, and she's not about to stop for some random Lord who finds her secret home. No matter how attractive he is. And the end ... I'm not going to give spoilers, but I am already looking forward to the next book in the series.. A Defence of Honor is the first full-length novel in Kristi Ann Hunter's new Haven Manor series, but it's not the first book. There is a prequel novella, A Search for Refuge, which is available as a free ebook. It's not necessary to read A Search for Refuge first, although I did, and I can assure you it will provide needed backstory to A Defence of Honor. Recommended for all Regency romance fans, because it's close to perfect. And Kristi Ann Hunter is a wonderful witty writer. I loved this story! Set in Regency England, Katherine, who has already been rejected by high society is rescuing the children of highborn women who find themselves pregnant yet unmarried. Hopefully allowing the women to continue lives without rejection and providing a better future for the children. As you read this story you can feel the anguish that comes with this situation. Add to the picture Lord Wharton, a curious and clueless guy and you find yourself laughing even as you feel the pain in the situation. This book is so brilliantly written. I can't wait to read more books in this series. This regency romance novel by Kristi Ann Hunter is the first of the Haven Manor Series. It is the tale of two friends, Kit and Daphne, taking on London society after Kit's drive lands them in a tricky situation. They dedicate their lives to saving mothers from the scorn they had experienced and raise the innocent children so they might have a future. When Kit meets Graham, she starts to question her life and the decisions she made. She learns to deal with her past and to let go of her guilt. She learns of grace and what it means to ultimately put her trust in God. I loved reading this book, it was very inspirational. There were character traits that I could identify with and the lessons Kit had to learn is so relevant to life right now. Kristi writes in such a way that you are completely transported into the world of the characters. This is a book I will be reading again and again. I can't wait for book 2 in this series! This book set in England's Victorian era tells the story of a small group of women helping women pregnant out of wedlock and their children. It is sensitive and lovingly done. The characters are challenged in their views of right and wrong and God's grace. The romance is sweet and it has a happy ending for the couple and the children. I really enjoyed reading it and look forward to reading the rest of the series as they are released.